The Guide to Modern Employee Recognition What is Employee Recognition? 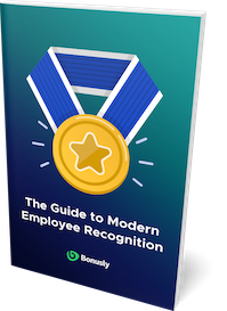 The Guide to Modern Employee Recognition provides the foundation of knowledge you need to build and support a culture of recognition in your organization. Employee recognition (also commonly referred to as staff appreciation) is the open acknowledgment and expressed appreciation for an employee’s contributions to their organization. It is not simply a box to check on a ‘best practices’ worksheet. It has the power to impact everything from productivity and motivation, to engagement and retention. It's a crucial element shared by many of the world's most successful organizational cultures. There are many methods and channels for giving recognition. Although commonly given by managers or supervisors, recognition is not the exclusive territory of management. It can be given by anyone. Will Recognition Work for My Team? Yes. A recognition-rich culture is a worthy and achievable goal for any organization, in any industry. It benefits everyone, from the new hire candidate to the CEO. The key to success is understanding how employee appreciation works, and how to implement it effectively in your unique environment. Staff appreciation programs can be implemented without major budgetary strains, or any significant burden to management. In many cases, the budget is already there, just allocated less effectively somewhere else. What Can I Expect from This Guide? The Guide to Modern Employee Recognition covers the knowledge you'll need to successfully cultivate and support a culture of recognition in your organization. We'll start by laying a solid foundation for you to build on. Then we'll walk through the basic steps required to successfully develop, implement, and maintain an atmosphere of appreciation and recognition in any organization. You can start with any section you find interesting or useful, but we recommend you start with the fundamentals and build up from there. If you're already familiar with the fundamentals, it will be a great opportunity to brush up on current best practices. We'll begin with an overview of what makes an effective employee recognition program, then dive into some tutorials on implementing proven staff recognition techniques, strategies, and tools. Only 13 percent of organizations offer formal training in employee recognition. Read next Why is Employee Recognition Important?